this snow brick maker from land of nod really makes me want to go outside and build a snow fort with my little z man. 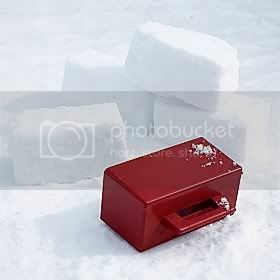 i used to make the best snow forts, and this snow brick maker looks awesome! Oh to have enough snow to even use such a neat gizmo! Have fun! That’s a great gadget to have. Makes me want to build an igloo! Hi! Just stopping by… You have the cutest things on your blog! I like to see what fun new things you have going on! My kids have one of these brick makers and it is soooooo fun! They really do work! Take care…. o i love this! when i was a kid i used to make forts out of hay bales in my grandfather’s barn. an ice fort would be such a fun adventure! no way!!!! when i was little my dad would spend hours and hours making tunnels and forts for us! I love this. I used to make snow igloos as a kid. I already miss our Portland snow!